In his 'Church History', Eusebius (d. 339) attempted to record the history of the Church from the time of the apostles to his own lifetime, arranged according to the reigns of the emperors. Rufinus translated it from Greek into Latin, and continued it to the year 395. It became a standard work of Church history, and was to be found in many medieval monastic libraries. This copy belonged to the abbey at St. Albans. 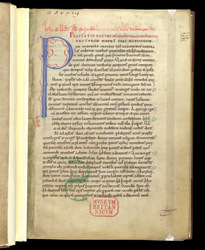 At the top of this page is a typical ownership inscription and anathema of the Benedictine abbey of St. Albans. From the space left by the scribe for the painted initial, it is clear that he expected the artist to make the 'P' taller, and to have a differently shaped bow.